The creation of Acrobuffos husband and wife team Seth Bloom and Christina Gelsone Air Play merges their circus and street theatre performance art with the sculptured artistry of Daniel Wurtzel. The talented couple met at the circus in Afghanistan and married at a clown festival in China where Christina (bride) wore a dress made out of tiny white balloons. Air Play is a circus style adventure of two siblings journeying through a surreal land of air, transforming the ordinary into objects of uncommon beauty. The concept is a deceptively simple one: to play with balloons, fabric and even glitter in the air. The curtains opened at the Lowry Theatre to Bloom who stood dressed in red with vibrant blue hair holding onto a huge piece of red sheer organza light fabric, dancing in the air moved by a simple circle of circular fans He is quickly joined by Christina dressed in yellow with stunning purple hair, holding onto a yellow piece of sheer organza fabric where the two colourful light weight fabric intertwine and dance together high in the air. The whole performance is played without words, only the use of facial expression and acting is used, but it’s far from silent with its soundtracks leaping through genres throughout the evening. Bloom and Gelsone engage the audience throughout, themselves interweaving and clambering over a chair to retrieve their floating balloons which are always either red or yellow. At one point two spectators are called onto the stage to play a game of collecting balloons. At another point Bloom and Gelsone are seen to climb into their respective coloured large balloons and perform a hilarious choreography scene ending in one of the balloons bursting, thrilling the captivated audience. The performance was not only playful but funny, glittered with visual delights of ordinary objects such as balloons, umbrellas and fabric creatively dancing sculptures in the air aided by fans and ventilation. Such simplistic beauty captivated the old and the young during the 60 minute show, a joy from start to finish, Air Play entranced the audience. The finale saw a huge balloon filled with foam balls burst creating a snow globe scene where the couple played like children in the snow. Every element of this show is finely crafted and displays the exquisite talent for their interpretation of comedy and visual elegance. 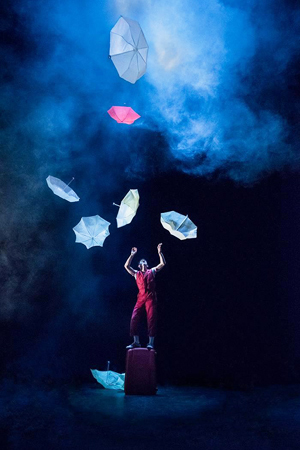 The couple compare their show to a miniature Circus where there are laughs from clowning and juggling, a spectacle of an aerial act and the suspense you’d get from a lion tamer on the edge of potential disaster. Whatever their thoughts are on the performance I can guarantee you’ll be surprised at the beauty, never have I been so absorbed by balloons and fabric. A fantastic evening of pure family entertainment which was captivating for the entire 60 minutes, well done to all involved in this magical creation.